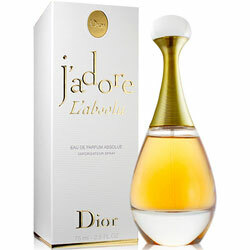 "J'adore L'absolu is an intense floral. A unique rendering of the original floral bouquet, augmented by flower absolutes. J'adore L'absolu carries in its height the science of flowers and the perfumer expertise. While remaining faithful to the classic formula, Dior's perfumer-creator Francois Demachy deftly reinterprets J'adore Eau de Parfum using absolutes of Jasmine, Tuberose and Ylang Ylang. An invitation to a lush garden blossoming with intensity and emotion." J'adore L'absolu is an intense floral. A unique rendering of the original floral bouquet, augmented by flower absolutes. Top Note - Ylang-Ylang of the Comores: The Flower Absolute is a complete, rich and infinitely precious substance that heightens and reveals the heart and base of flowers. Heart Note - Four Flower Absolutes (Sambac Jasmine, Damask Rose, Ylang-Ylang of the Comores, Tuberose): The Flower Absolute is a complete, rich and infinitely precious substance that heightens and reveals the heart and base of flowers. Base Note - Tuberose Absolute: Imported from India to Europe around 1600, Tuberose is an herbaceous plant with highly fragrant white flowers that grow in clusters. Indian Tuberose absolute offers J'adore l'Absolu a heady, honey and orange-scented floral note, for noble and luxurious intensity.